PALM HARBOR, Fla. - Ernie Els said the Copperhead Course at Innisbrook Resort and Golf Club is "the best golf course the PGA Tour plays in Florida." The notion was seconded by Stewart Cink. Curtis Strange said, "I could play this course for the rest of my life and enjoy it - it has that much character." With the pros gushing like this, who needs public relations people? Not that the PR folks at Innisbrook don't do a fine job, but a course like this makes their lives a lot easier. The Copperhead is indeed one of the better courses in Florida, which is why the pros visit every fall for the Chrysler Championship. But, is it better than Doral, the TPC at Sawgrass or even World Woods? That probably depends on your perspective, but there's no denying Copperhead is one of the top resort courses in the state and even the country. 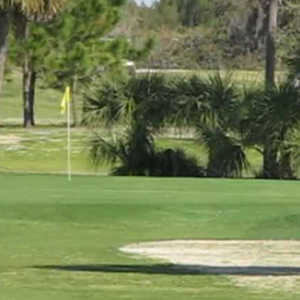 First of all, it isn't a typically flat Florida course even though it's pretty far from the central highlands of the state, which also give you some atypical Florida highs and lows. Copperhead has up to 70 feet of elevation changes, and you might think for a fleeting instant you're in the Carolinas. However, the April heat will quickly un-cloud your thoughts and make you remember you're in Florida. And if that doesn't do it, the Spanish moss-draped cypress trees and alligators sunning themselves beside the lakes and ponds will. It's long, at more than 7,300 yards from the back tees, with rolling fairways that bend, twist and bank and climb uphill and down. It has a distinctly, old-time Florida backwoods feel, even though the emissions from the gazillions of vehicles careering down Highway 19 are less than a half-mile away. Larry Packard designed Copperhead as well as the other three courses at the resort. Packard, who lives in nearby Tarpon Springs, is an architect with an international resume, including Bomun Lake Golf Course in Korea, Hacienda Nueva in Guatemala City and Dreamlands Pyramid Country Club in Cairo. Here, Packard has put together a course with plenty of risk-reward options, but only if you choose the tees that are right for you. You can get a great roll, maybe 40 more yards, if you hit over certain fairway bunkers, with a resulting short iron into the green. But, miss it - either short, right or left - and you're in trouble. Deep trouble. "If you don't put the ball in the fairway here, it's going to be almost impossible to play any type of good golf," said another pro, Rocco Mediate. "It's just that simple." There are some intimidating holes, like the 605-yard, par-5 fifth, where you tee off over water and uphill. Fairway bunkers right and left with a tree-lined fairway, though it has a wide landing area. According to course officials, this is one of four par 5s that none of the pros reached in two on their Florida swing. It's easy to believe. Or No. 14, a double-dogleg, 572-yard par-5 hole - careful, that gentle rise on your right drops off sharply behind to water: stay left here or suffer. No. 16 is a long, dogleg par 4, with water coming around to about 40 feet short of the green. Like Innisbrook's Island course, this course doesn't have an easy par 3 on it. 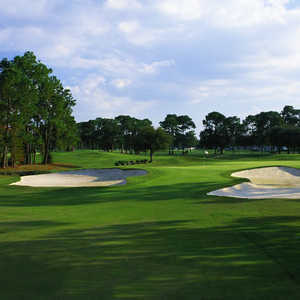 One of the better courses and one of the best resort golf courses in Florida, your game will be challenged at Copperhead. As with most difficult courses, you can ease your pain by choosing the right set of tees. Still, for women, this course will be difficult. Be forewarned: if you want to play from the tips, they tweak the course every summer to make it a little more difficult for the pros. Take No. 18 for example, where they added three church bunkers in the right fairway. "The pros would just bomb it to the right and not worry about it," said Innisbrook spokesman Doug Schmidt. "Now, they have to worry about the church bunkers." Also, the greens, though not severely undulating, have a lot of breaks that aren't easy to read. "They're subtle," said Stan Mikita, the former Chicago Blackhawks hockey great, playing on a recent day in April. "I wouldn't have known that putt (at No. 16) was uphill unless I'd been told." 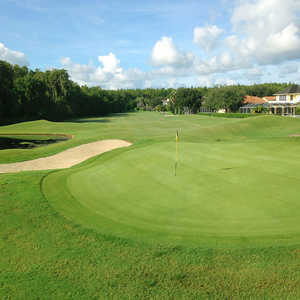 The course is lush and green. They overseed everything here, including the rough. Copperhead is open only to resort guests, members and friends of members. Green fees are $160 for resort guests. The Innisbrook Resort and Golf Club is one of those all-inclusive golf resorts where you'll never have to start your car engine or carry your clubs, unless you want to practice your bad swing in the privacy of your golf villa. They'll whisk you and your clubs to whichever course you happen to be playing that day and all you have to do is show up for your tee time. It's a big resort, built on more than 900 acres between Highway 19 and the Gulf of Mexico, with the beaches a short, though congested, drive away. Innisbrook Resort has 600 guest suites in 28 lodges scattered around the grounds, with six swimming pools, including the monster Loch Ness, which reportedly cost $3.4 million to build. There is a fitness center, of course, a wildlife preserve, 60 acres of lakes - including some mighty fat largemouth bass - as well as jogging and cycling trails. If you tire of golf, there are 11 tennis courts and three indoor racquetball courts. For you business types, there is 65,000 square feet of "flexible meeting and banquet space." Three of the four courses have clubhouse restaurants, the best of which is Packard's Steakhouse at Copperhead. The restaurant was modeled after south Florida's Shula's Steakhouse, with big meat and martinis to compensate for the problems you had at Copperhead. The Island clubhouse has the Turnberry Pub, an informal restaurant serving breakfast and lunch. Highlands has Bamboo's Caribbean Cafe, serving Caribbean food like Dungeness crab cakes, and grouper sandwiches, as well as Philly wraps, hamburgers and "South Beach chicken salad." The Loch Ness pool and spa has a grill that has burgers, salads, sandwiches and pizza. Mikita, at 65 years old, looks like he could step back on the ice now and wreak havoc, like he did in his playing days. His game is still good, though he said: "I'm swinging so bad now, my friends in Chicago are sending limos for me."